A black smoker is a kind of hydrothermal vent that can be found on the ocean floor. It is a crack in the planet's surface from which geothermally heated water comes out. Hydrothermal vents are commonly found near volcanically active places, areas where tectonic plates are moving apart, ocean basins, and hotspots. Hydrothermal vents are common on earth because it is both geologically active and has large amounts of water on its surface and within its crust. Common land types include hot springs, fumaroles and geysers. The most famous hydrothermal vent system on land is probably within Yellowstone National Park in the United States. 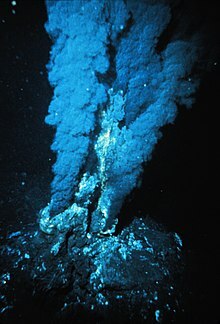 Under the sea, hydrothermal vents may form features called "black smokers". Relative to the majority of the deep sea, the areas around submarine hydrothermal vents are biologically more productive, often hosting complex communities fueled by the chemicals dissolved in the vent fluids. Chemosynthetic archaea form the base of the food chain, supporting diverse organisms, including giant tube worms, clams, limpets and shrimp. Active hydrothermal vents are believed to exist on Jupiter's moon Europa, and ancient hydrothermal vents have been speculated to exist on Mars. This page was last changed on 14 May 2018, at 21:25.